Our Derma Pen treatments regenerates new healthy skin cells & reduce wrinkles & scaring. 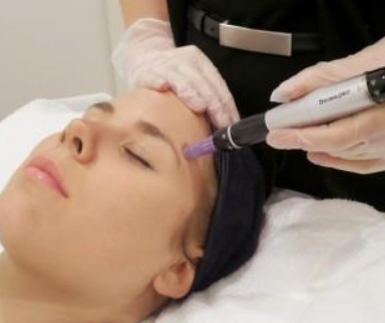 The derma pen treatments also include other high performance treatments to maximize the best facial results. numbing cream before 3- 4 days down time. How does the skin needling facial treatment & derma roller work? The Derma roller offers unparalleled collagen induction by harnessing the body’s innate ability to re-grow and repair the skin as a response to micro-needling. The derma roller delivers up to 1,300 micro punctures per second into the skin, stimulating the production of collagen and elastin and normalizing various skin functions. Derma roller allows 3 phases for new collagen growth to occur. The first phase begins with the release of the body’s own growth factors, followed by a cascade of new epidermal growth, fibroblast chemo-taxis, fibroblast proliferation, and matrix production. The body’s tissue continues to release growth factors from fibroblasts, keratinocytes and monocytes which culminate the production of collagen I, III, and IV, elastin, proteoglycans and Glycosaminoglycans, increase new circulation, skin plumping, firming, tightening, lifting. Double Cleanse, Microdermabrasion * Derma roller + LED + Bio Lift firms, lifts, regenerates new cells, speeds healing time & lighten pigmentation. Double Cleanse, Microdermabrasion * Derma roller + Bio Lift + RF Skin Tightening LED firms, lifts & tightens skin, regenerates new cells, speeds healing time & heals sun damage.